Breezes Bahamas Resort & Spa in Nassau will pay guests $100 if their legal first names match the names on the 2013 National Hurricane Center’s list of named storms. 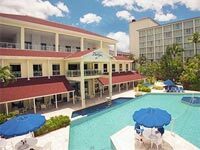 The resort will gift $100 to any “same name” guests who book a minimum five-night stay at the all-inclusive resort and travel by Oct. 31. Anyone whose legal first name (as it appears on a passport) is Andrea, Barry, Chantal, Dorian, Erin, Fernand, Gabrielle, Humberto, Ingrid, Jerry, Karen, Lorenzo, Melissa, Nestor, Olga, Pablo, Rebekah, Sebastien, Tanya, Van or Wendy automatically qualifies.